I worked as an intern at the Landmarks Preservation Commission, in the Research Department. The Research Department is responsible for evaluating proposals for landmark designations throughout New York City. Staff are responsible for preparing necessary information relating to buildings and neighbourhoods that are considered by the Commission as potential landmarks or historic districts. 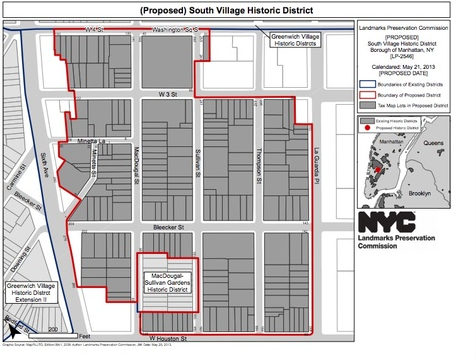 While at LPC I was tasked with researching and documenting buildings in the South Village, a soon-to-be historic district bordering and extending the Greenwich Village Historic District. The scope of my research was primarily architectural history, though I did have the opportunity to work with others researching cultural heritage like speakeasies, beatnik coffeehouses, and jazz clubs. 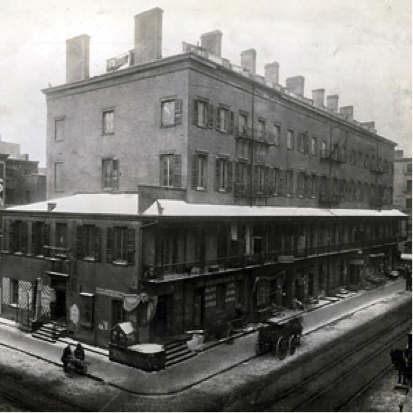 My research focused on an early building type in the South Village: the terrace house. Terraces are groupings of houses that share side walls and are built in an identical or mirror image, by a single developer. Terraces largely defined the South Village in the 19th century, with most built between the 1830s and 1850s. Very few survive intact today. When I researching, I aided the Research Department in building a digital archive by scanning and labelling photographs and slides of every building in the proposed South Village Historic District. Every Tuesday I attended public hearings of proposed landmark designations, led by members of the Research Department.